As a registered dietitian nutritionist, I’m often asked what kind of food I feed my kids. Sugar-free? Impossible and not enjoyable. Hello, I’m married to a man from Wisconsin. We love our dairy foods, thanks. All organic? Not necessary, in my opinion. I spend more on some organic produce and milk, but I don’t purchase only organic foods. All homemade? No! I do what I can and stock up on frozen and pre-packaged ingredients and meals to help save me time. Don’t get me wrong though. I have high-standards for any pre-made foods. I look for simple ingredients lists (“OK, these are all ingredients I have in my pantry at home”) with no added sugar (different than foods naturally containing sugar like dairy) or added colors or preservatives. Enter, EatPakd, the Chicago-based meal delivery service available in the Mid-West serving up wholesome meals for kids crafted by award-winning chefs. Their meals are free from preservatives and added sugar, and are made with some organic, hormone-free and GMO-free ingredients. I love that they cater to all by offering vegetarian choices, customizable options and all recipes are nut-free. 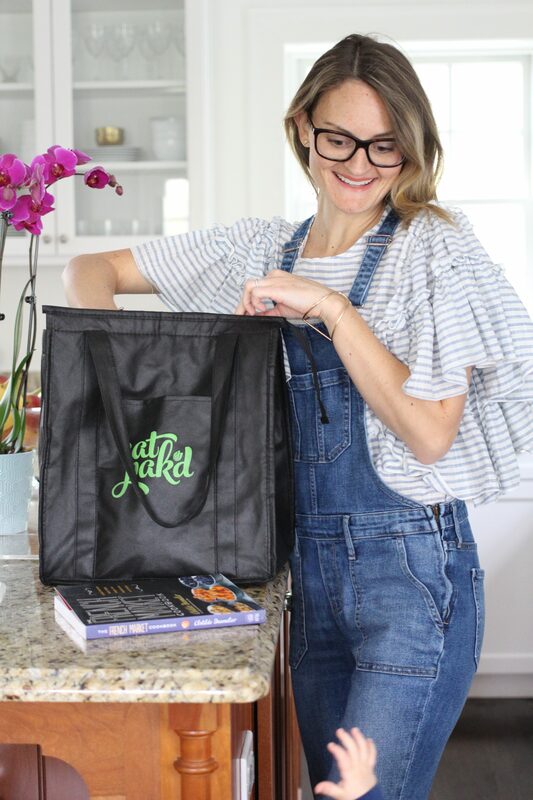 My family and I first discovered the beauty behind EatPakd in January and I’ve been raving about it ever since which is why i’m thrilled to be working with EatPakd this month to offer one of my readers an entire month of FREE EatPakd meals! UPDATE! Thanks to everyone for entering the giveaway for one month of delicious meals from Eat Pakd! The contest is now closed and I will contact the winner later this week. Yay! Mama Bag Essentials + A Giveaway! As a mom of little ones, I love to get the scoop from friends and fellow parents about their favorite products. You know, that “must have” item you never leave home without because it helps to prevent that public meltdown or makes snack time on-the-go easier. Since last fall, one of my “must have” products I carry in my bag is Evian® Natural Brumisateur Mineral Water Facial Spray. It’s chemical-free, lightweight and the perfect shape to slip into my purse side pocket (bonus points for easy access), but I love it’s dual purpose as a product both my kids and I can use. For me, I use it as a skin and hair refresher and makeup enhancer (more about that here) and for the kids it’s a gentle mist for cleaning messy hands, soothing dry skin and helping to control an Alfalfa hair day. With warm summer days upon us, it also makes for a nice little portable mister on those really hot days. – Little plastic toys the perfect size for balancing on a restaurant table or holding in the car. – Crayons, a small coloring book and a page of stickers. This combo equals at least 30 minutes of content playing time for each child. – Individual applesauce pouches. They are perfectly portioned, don’t need to be refrigerated and make for a wholesome snack. My kids love the idea of the pouches almost as much as the applesauce itself. If you’re a parent, what are your favorite products to keep stocked in your bag? I’m always looking for some fresh ideas! Evian is giving three lucky winners a Skip Hop Duo Signature diaper bag, in Heather Grey, filled with a 10oz, 5oz, and a trio of travel-sized evian facial sprays! I love Skip Hop products and you all know my feelings about evian facial spray. 🙂 Go here to enter – good luck! My Valentine’s Day outfit of the day (#OOTD) may not be Instagram-worthy, but Sloane’s look will be on point. We gifted the kids early Valentine’s presents over the weekend and these were included in Little Fashionista’s gift bag. I only wish this soft LOVE Old Navy sweatshirt and the sparkle pom pom purse came in adult sizes. I would happily have a twinning moment in this ensemble. The bright colors and pom pom details hint of springtime which feels just (kinda) around the corner. This LOVE sweatshirt sold out as I was writing this post (! ), but I found a handful of equally adorable heart and LOVE sweatshirts for your little Valentine’s this year, linked below. This adorable pom pom purse is still available from Target for less than $10! How will you be celebrating Valentine’s Day? I hope it’s a day full of happiness and LOVE!